Silver prices today are mostly flat, down just 0.03% in morning trading, to $16.83 per ounce, as the broader stock market rout continues. On Monday, a serious purge took the S&P 500 down 4.1% and the Dow down a gut-wrenching 4.6% in a single day. Bitcoin lost 12% to reach $7,200, and oil also lost 2.7%. It was the largest point drop in a single day for the Dow… ever. But as Monday's stocks and oil market bled profusely, silver prices refused to join in the pain. Not even a considerable bounce in the U.S. dollar or Treasuries were enough to hurt the price of silver. Instead, the precious metal was up by 1.1% as most other assets tanked. 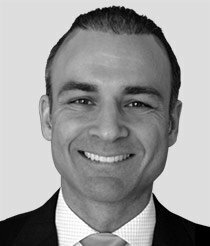 It was a testament to the metal's safe-haven qualities, which help counter losses for those who've been wise enough to include silver in their portfolio allocation. On Tuesday, Jan. 30, silver first enjoyed considerable dollar weakness. The U.S. Dollar Index (DXY) sold off hard in the very early morning. It started out above 89.5, but by 7:00 a.m. was down near 89. But its afternoon bounce to 89.25 weighed on silver, which after opening at $17.19 retreated to close at $17.09. On Wednesday, Jan. 31, silver enjoyed a decent rally. It started trading in New York at $17.23 and closed at $17.30. The dollar was weaker, with the DXY selling off early to spend the morning around 88.90. But even the DXY's afternoon jump to 89.10 wouldn't hurt silver prices. 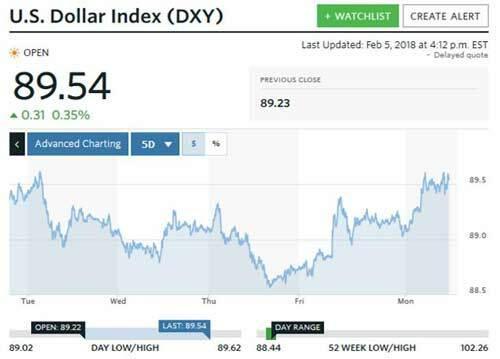 On Thursday, the first trading day in February, the DXY hovered around 89 in the morning, but as of 10:00 a.m., began selling off once again. That took it to a low of 88.57 by 3:45 p.m., from which it rallied slightly, to 88.6 by 5:00 p.m. Silver would open at $17.18, then weaken down to $17.08 at 1:00 p.m., at which point it reversed, then headed higher to close at $17.19. Here's a look at the DXY for the last five trading days. 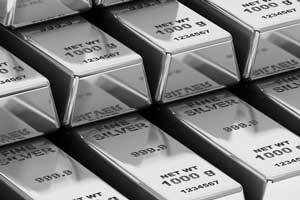 As I said above, silver did join in the global stock weakness that permeated Friday. The dollar was a safe haven that popped from 88.85 at 8:00 a.m. to 89.38 by mid-morning. From there, it gave into sellers, who pushed it back to 89.20 in the afternoon. Silver opened at $17.11 but showed its penchant for volatility, quickly dropping to $16.66 by noon, then further to $16.57 by 5:00 p.m.
With global stocks selling off in Asia late Sunday evening, silver bounced together with the dollar. The DXY opened up at 89.30 and marched higher to spend most of the day around 89.50. Silver opened at $16.88 at 8:00 a.m. but closed at $16.71, which was nonetheless higher than Friday's close at $16.57.